Chelsea and Champions League holders Barcelona will renew their rivalry after they were drawn together in the first phase of this year's competition. The two sides, who have now been paired for the third time in three years, also face Werder Bremen and Levski Sofia. Manchester United will meet Celtic in Group F with Benfica and FC Copenhagen. Last year's finalists Arsenal take on Porto, CSKA Moscow and Hamburg while Liverpool face PSV Eindhoven, Bordeaux and Galatasaray. AC Milan, who were found guilty in the probe into match-fixing in Serie A but were re-instated on appeal, are with Lille, AEK Athens and Anderlecht. One of the toughest groups looks to be Group B, which sees Inter Milan, Bayern Munich, Sporting Lisbon and Spartak Moscow. Chelsea and Barcelona have had acrimonious clashes over the past two seasons - with both teams taking a win each. 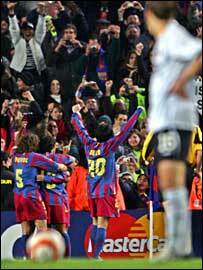 The Premiership champions beat Barca 5-4 on aggregate in the first knockout stage in February 2005. But the tie was overshadowed by Blues boss Jose Mourinho claiming Barca counterpart Frank Rijkaard visited referee Anders Frisk's dressing room at half-time of the first leg. They then clashed again last season with Barcelona going through after securing a 3-2 aggregate victory. But again there was bad blood after Chelsea accused Lionel Messi of over-reacting to a challenge by Asier del Horno, which led to the Blues full-back being sent off. Chelsea chief executive Peter Kenyon says he wants to move on from the recent controversy. "We have a great respect for them and we have a good relationship with them and I hope people concentrate on the football," he said. "We have to move on from what has gone on before. "This is what the Champions League is about at the end of the day. Fans want to see us against the big teams and they don't come much bigger than Barcelona. "We shouldn't overlook the other sides in there. Werder Bremen have had a good start to the season. It's a big group." Manchester United chief executive David Gill said he is relishing the clash with Scottish champions Celtic. "It's a great draw. It's great for the fans and great for the manager Sir Alex Ferguson," he said. "We have not played against Celtic in a competitive fixture - the last time the two sides met was back in May when we played in Roy Keane's testimonial. "The atmosphere that night was fantastic, now we've got a competitive fixture I'm sure it will go up many, many decibels." But Celtic boss Gordon Strachan said that he would rather have faced a club like Real Madrid. He told BBC Scotland: "I've been to United so many times as a player and a manager, and even with Celtic. "I would have liked Real Madrid. Something different." Arsenal's German goalkeeper Jens Lehmann was delighted that his side, who were defeated by Barcelona in last season's final, will take on Hamburg in the first phase. "I'm quite happy with Hamburg," he said. "We finally get to play a German side and I've always been looking forward to that. "They are always dangerous at set-pieces. You always have to be aware of this strength. "Porto and Moscow are good teams but we have the favourite's position in this group." Liverpool chief executive Rick Parry was satisfied with his side's draw - which sees them return to Turkey - the venue of their triumph in 2005. "We have fond memories of trips to Istanbul," he said. "PSV and Bordeaux are a little bit of an unknown for us, but it's okay. There is no such thing as a favourable draw, none of the groups is that easy. "Turkey is a long way but we've avoided the eastern European trips. We are looking forward to it."